Having featured Grimsby in this section last time out, we meander only a few miles inland and highlight the Zebras of Brigg Town. And we meet up at a time when the club are just starting to recover from their weekend celebrations, after having won the FA Vase on Saturday thanks to a 2-1 victory over Sudbury Town. One half of NUFC.com decided that rather than watch the FA Cup Final, a wee excursion over the Forth Bridge was called for, and so he pitched up for the final Pars home game of the season. The game finished 2-2 and thanks to a generous season ticket holder outside the ground, free admission was secured. Now far be it from us to moan, but had we paid £15 for the pleasure of sitting through this we'd be slightly miffed, given the poorness of the footie on display. If ever a game summed up the kind of season the Pars have had this year then surely this afternoon’s performance against Kilmarnock did so if match that went from the sublime to the ridiculous. From outstanding passing play, a two goal lead, lose a flukey goal, miss a barrel load of gilt edge chances to finish the game and then, finally, the inept defending that lets Killie get an injury time equaliser. PS - Our photo is of Lithuanian defender Andrius Skerla, once signed by a certain Bobby Robson when he was managing PSV Eindhoven. Former friendly opponents*, CD Nacional of Madeira remain in a comfortable mid-table slot in the Portuguese Superliga, having been promoted in the previous season thanks to a 3rd place finish in II Liga. *We played a tournament in Madeira before the 1982/83 season, drawing 0-0 with Nacional and beating the other main local side, Nacional, 1-0 thanks to a Waddle goal. United's brief visit is perhaps best remembered for an incident in which goalkeeper Kevin Carr walked through some plate glass doors, apparently having had too many glasses of the local juice. While he recuperated from cuts on his arms and hands, Steve Hardwick earned an unexpected recall to the first team and was between the posts for the first six games of that season, including of course the memorable 1-0 home win over QPR inspired by debutant Kevin Keegan. Back to January 2001, and future mackem flop Jason McAteer tangles with Doughty of Chester City, the latter wearing a short-lived TAPIBAW away strip. 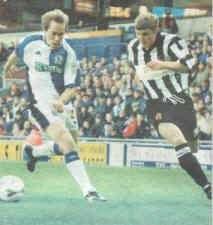 The game, a 3rd round FA Cup tie at Ewood Park ended in a 2-0 victory for the home side. 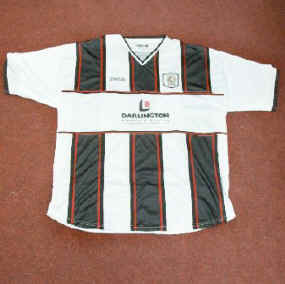 But what wasn't explained was why Chester had opted for this particular away kit. "In 1919 the club entered the Cheshire County League and their new dark green shirts earned them the nickname the Ivies, although they were still more popularly known as the Linnets. In 1920 Chester changed to black and white stripes and a nickname of the Magpies was adopted. "Black and white remained the colours until the arrival of Charlie Hewitt, as secretary-manager, in 1930 when Chester switched to the much loved blue and white stripes. "For the next 30 years the colours remained the same with the exception of the 1952/53 season when the club played in white shirts and black shorts." Debate raged over this one and whether it justified inclusion due to it's undoubted hint of redness, but in the end we thought we'd give the Quakers the benefit of the doubt and showcase their new garb for 2003-04. Those perennial underachievers from Feethams have appeared in various combinations of black and white over the years, but we can't remember a home strip with what can only be called stripes. If you want to have a look at the new ground, it's on Neasham Road to the South East of the town, and is scheduled to open for business with a league game against Kidderminster on August 16th. Leyton Orient are then the visitors on bank holiday Monday August 25th, another day when Newcastle don't have a game. There are no pre-season games at the ground and a proposed ceremonial opening game against a "local side" is also still unscheduled.